An Interview with Worldwide Travel Bloggers: Is Halong Bay Being Overrated? Recognized as a UNESCO World Heritage Site, Ha Long Bay with its stunningly picturesque scenery, is an excellent choice for a getaway you will never forget. However, after all those years welcoming hordes and hordes of tourists, you may wonder: does Halong Bay still hold its charm and stand out? How was your trip to Halong Bay and what made you most impressed at when visiting this place? How is Halong Bay different from other bays that you’ve visited? Let’s hear their thoughts and sharing about their trip to Halong to see what of Halong Bay impresses them and sets itself apart from other famous bays worldwide. “Halong Bay was actually the place I’d chosen many months in advance to propose to my partner. I’d never been there before, but I’d seen enough photographs of the spectacular scenery to judge that it would be something a little beyond the ordinary and worthy of such a momentous occasion. I’d chosen well. Despite several years of constant travelling, Halong Bay remains one of the most stunning examples of natural beauty I’ve ever encountered. What really makes Halong so different is the islands – hundreds upon hundreds! 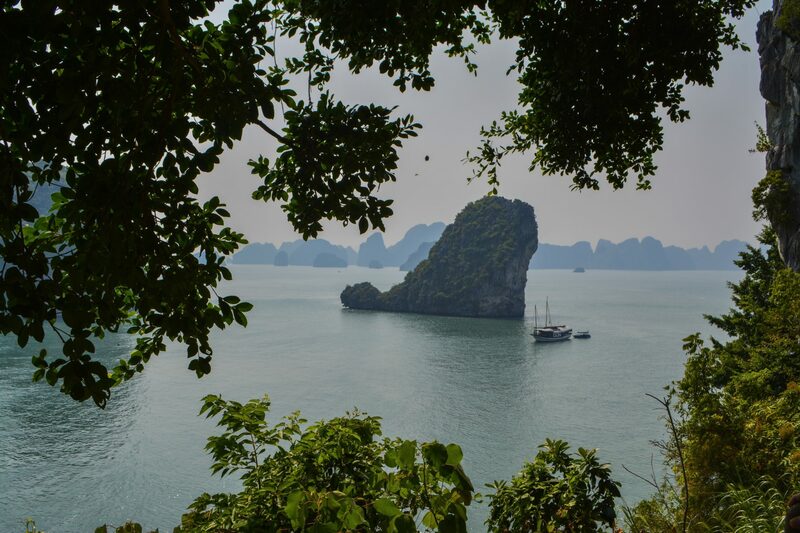 “When planning my trip to Vietnam, Halong Bay was high on my list of things to do and as soon as I arrived in Hanoi I was keen to book on to one of the best Halong cruises. I loved every second of the three day/two night cruise I booked on one of the old junk boats, I sadly don’t remember the name of the company but we had three days of cruising across the bay, kayaking, a cooking class, exploring caves and much more. It was a great way to experience the Bay and a personal highlight was kayaking early in the morning and visiting a nearby floating village. I was really impressed that despite how incredibly touristy the area is – the sheer number of cruises is astonishing – but when you were out on the water you still retained that sense of solitude and peace, that beautiful silence as the sun slips under the horizon at sunset. “We spent several days on a boat, marveling at the beautiful surroundings, swimming, kayaking and hiking to see and learn as much about Halong Bay as possible. The beginning of the Bay is crowded with boats and tourists, but as you move further and further you realize how small you are in comparison to the thousands of green covered rocks. It’s a must see stop on your Vietnamese vacation. Q: What made you choose Halong Bay? How did you prepare for your trip? A: I always research my destinations, and my research made it clear that Halong Bay was one of the most beautiful places in Vietnam — possibly in Southeast Asia. I visited a travel agency in Hanoi and viewed a number of offers before deciding on a two-day cruise. Q: What were you most impressed at when visiting this place? A: I was captivated by the romantic, misty scenery that surrounded us on all sides. These are the pictures you see in travel brochures, and now I was seeing them in real life. The caves on Hang Sung Sot were amazing, as well, with strange and beautiful rock formations. And it was a great experience cruising through the bay on a small ship. Q: If there’s one thing you could to do better your trip, what would you improve? A: I would spend a bit more money and book a longer visit. With the drive from Hanoi and back, two days doesn’t give you much time to see everything there is to see. I would have liked to have explored Cat Ba Island and some of the other wonderful sights of Halong Bay. Q: How did you do research and plan for your trip to Halong? Could you share some difficulties about choosing the right cruise? A: We began researching our first visit to Halong as part of our honeymoon and turned to search engines, reviews and the advice of friends for help. The amount of information out there was overwhelming and, the more we looked, the more confused we got. We didn’t have a big budget, so couldn’t book something luxurious and totally reliable. It felt like a big risk when we booked something budget-friendly and quite a few of the websites just didn’t seem reliable. In the end, we went with a company one of our friends had used and they were good. When we went back again a few years later and did a Halong Bay luxury cruise, it was amazing! So, I definitely think it’s worth going with the best you can afford – it just takes the worry out of it. Q: How was your trip and what made you most impressed at? A: Both trips were really enjoyable but our luxury trip was very special. The cruise ship was like a floating hotel, the food and service were fantastic and we loved sitting on our private balcony, watching the sunset with a cocktail. At night, we’d join in karaoke and dance all night – it was just so fun! The day trips from the ship were great and the staff know so much about the local area, it’s just a great experience. I don’t think there’s anywhere else quite like Halong, the jagged limestone islands and bright emerald water, the brilliant orange sunsets and the amazing hospitality – it’s magical. Q: If you could change one thing about your trip, what would you want to improve? A: The hardest part is the transfer from Hanoi out to Halong, it takes quite a few hours to get there. I’ve heard there are small plane air transfers available through some cruise companies, which I would definitely be interested in next time. I’ve heard other people say they didn’t like seeing other tourists or the other cruise ships but that didn’t bother me at all, I liked seeing all the other boats lit up with twinkling lights at night and the visitors are great for the local economy. Halong is one of my favorite places in Vietnam and I can’t wait to go back again one day soon. Q: Why did you decide to visit Halong? Were you afraid that Halong is just too crowded? A: I’d heard rave reviews about Halong Bay from friends who had traveled through Vietnam, so when I had a chance to visit the country for myself, I knew I had to go. I wasn’t worried about the crowds in Halong, but, with a variety of tour operators, I did want to make sure I chose one that suited my interests. Q: What made you most impressed at when visiting this place? A: Being in Halong Bay felt like I was lightyears away from the rest of civilization, in my own little world, especially because I stayed on a private island. The scenery was stunning, and I loved being able to stay right on the beach, wade in the water observing bioluminescent plankton, and watch a thunderstorm roll in over the bay. Q: Could you share some tips and advice on Halong traveling? A: It’s difficult to see Halong Bay on your own, without booking a tour, but make sure the tour you choose is right for you. You’ll likely be spending several days with a small group of people, so research the tours’ demographics and find one with people similar in age and travel interest. Q: How was your trip to Halong Bay and what made you most impressed at when visiting this place? A: My trip to Halong Bay was pleasant, exciting and memorable. Looking at those magnificent karst rising out from the sea was definitely the major highlight for me. Although the bus ride from Hanoi to Halong Bay was a little too long at 4 hours, once I was on the boat and out at sea, it was all worth it! Since I went in the month of March, the weather was cold and misty. This may not be very good for photography but I love the ethereal effect it had on me. However, what impressed me most on this trip was the kayaking activity. It was my first time kayaking so I was both nervous and excited. I still remember that I kayaked through a cave and when I came out on the other side, it was almost as if I had entered another world. The feeling was indescribable, I felt so calm and at peace. If I were to visit Halong Bay for a second time, I would definitely go kayaking again! Q: How is Halong Bay different from other bays that you’ve visited? A: So far, I have only visited two bays in my life. One is Halong Bay and the other is Li River in Guilin, China. Both feature karst mountains and I have to say both are impressive and worth visiting. The karst mountains look awesome along Li River although they are mainly on land, whereas the karst in Halong Bay are in the sea, so the effect is somewhat grander to me. I always like some kind of adventure (not the extreme kind) during my travels, and I find in this respect, Halong Bay has the upperhand as it offers activities like kayaking, caving and swimming. The Li River boat cruise only allows you to enjoy the scenery from the boat but if that’s all you want, then it’s great. You can also stay overnight on the boat in Halong Bay which would be quite a different experience although I did not do that. Well, maybe I will give it a try in the future! So, here is the answer to your concern: Halong Bay is and will forever be charming! Yes, for sure, the grandeur and beauty of Halong Bay will dwarf you, take your breath away and show you how awesome Mother Nature is. Then it will leave in your mind the greatest memories ever, as the same way it did to those travel bloggers above. A great escape from the bustling civilization! Halong Bay Facts: Top 10 Intriguing Things!